Personalized Gift for Him? Customize this Best Bear Bunch for your gift need: Choose your favorite teddy bears up to 14 and place your teddies onto sofa in the way you like. Give a gift message and all of the first names for handwritten personalizing, free of charge. Add the impressive accessories for extra personal touch. Best Bear Bunch, Customized Gifts Personalized Free! Choose your favorite teddy bears up to 14 and place your teddies onto sofa in the way you like. 8 X 4" over 4 lbs. For up to 14 bears and 14 accessories. 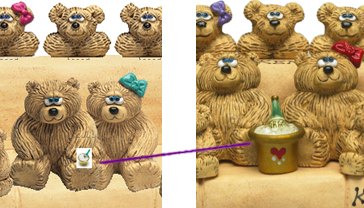 Size - ice bottle in bucket for example: Thumbnail (Preview); Full size that matches the bear (Final). Presented - ice bottle in bucket for example: Image on bear (Preview); put on Sofa (Final). Facing: Direction varies - In the example below. 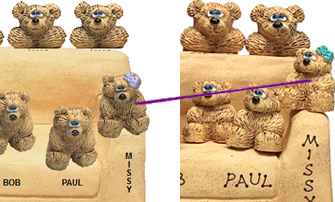 The girl faces downward (Preview); Faces to the same direction as the main bear's (Final).